The mean annual temperature is 30°C, with little seasonal variation, though March to October tends to be cooler. Humidity is high. Trade winds blow from the east for much of the year. Although the islands are north of the recognised hurricane belt, severe cyclones struck in 1894, 1972 and 1990. Rainfall is high, averaging 3,535 mm p.a. The wettest season is November to February. damage to coral reefs from the spread of the Crown of Thorns starfish; and rising sea levels threatening the underground water table. 10,000 (2012). The population density on inhabited islands is very high, especially on Funafuti; 51 per cent of people live in urban areas. The population growth rate stood at 0.4 per cent p.a. between 1990 and 2012. In 2012 the birth rate was estimated at 23 per 1,000 people and life expectancy was estimated as 65 years. 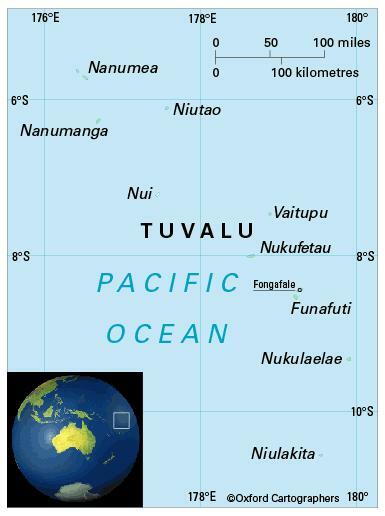 In February 2000, a request was made to New Zealand for resettlement of about a third of Tuvalu’s population, which was threatened by rising sea levels. The Tuvaluans are a Polynesian people. Tuvalu is classified as an upper-middle-income economy by the World Bank.